The sport of pickleball has been steadily gaining popularity in the greater Dayton area. A cross between tennis, table tennis and badminton, it’s played on a badminton-sized court with paddles and a plastic whiffle ball. The Centerville-Washington Park District began receiving resident requests for pickleball courts in late 2012. By spring 2013 we had lined two tennis courts at Schoolhouse Park for pickleball play. Shortly after, we added lines to the tennis courts at Yankee Park. As the sport’s popularity continued to grow, the Park District decided to add dedicated courts to Activity Center Park. 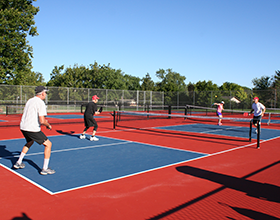 The existing three tennis courts were scheduled for updates this summer, making it the perfect time to convert the courts from tennis to pickleball. The Park District converted two tennis courts to four dedicated pickleball courts. The remaining tennis court was resurfaced for play, was lined for pickleball as well, making a total of six possible pickleball courts. A ribbon-cutting ceremony for the new pickleball courts at Activity Center Park was held Monday, September 19. Casual instruction, door prizes and refreshments followed the ribbon cutting. We are excited to offer this opportunity to promote active and healthy lifestyles in the community!